Your Senior Parent Need Care, But Doesn’t Want It – Now What? 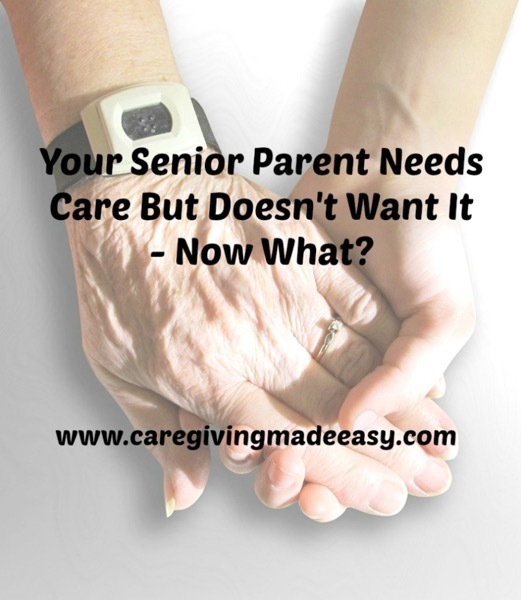 What to do when your senior parent needs care but doesn’t want it. A friend and I were recently discussing the challenge she and her siblings are having with her extremely independent 88 year-old mother. Her mother has cancer and is having difficulty getting around her two story house and she still insists on driving and volunteering outside the home. This obviously poses a big problem for her children as they don’t want to take away her independence, which likely helps her stay strong mentally and emotionally. However, they have to manage her desires with her personal safety since it is no longer safe for her to drive and she probably needs care in the home on a limited basis. So how can they respectfully help their independent mother accept her new norm and allow changes to her routines to improve her safety in and out of the home? My suggestion was to start with the driving, since that is probably the biggest safety hazard. She has already had a few fender benders, which is a sign that she may need to cut back on driving. As I discuss in my post on senior driving safety, you never want to go into the transportation discussion empty handed. Providing solutions for transportation so that a senior can clearly see that while they may no longer be driving, they can still enjoy all of their activities is critical in making the transition easier. Make sure you cover everything from trips to the grocery store to the hairdresser and lunch with friends. You don’t need to use one service to cover all of their needs. I found that the most successful seniors had a network of services they used so that they were never left stranded. If cost is a concern for your senior parent, figure out the cost of operating their vehicle. It is probably very close to what they will pay for services and they will be much safer. The cost of a car accident is far higher than what they will spend on transportation. I had a client who sold her car and kept the cash from the sale to use for transportation so that she wasn’t dipping into her other funds for transportation. I’m not totally on board with keeping a big sum of cash at home, but it was an interesting way of managing her transportation costs. It is extremely difficult to convince someone to allow a stranger into their home to perform tasks that they still want to do. My suggestion is to start slow and small. Perhaps your parent doesn’t need a daily caregiver, or actual caregiving tasks performed. Sit down together and think about the types of things that would be nice to get help with. Is vacuuming challenging? Perhaps cleaning the toilets or shower and tub are becoming more difficult or dangerous. Working with your parent will help them feel like you’re not making decisions for them. Does your parent need help with cleaning and food prep? Maybe just bring in a caregiver 2-3 times a week for a few hours to do housekeeping and help your parent prep food so that they can cook it when they are ready. I’ve even know families who hired a caregiver to do light cleaning and go for a walk with their parent so that they can get exercise outdoors safely. If you start slow and involve your parent, they will get used to having a bit of help around the house and the more help they need, the more willing they will be to accept it. Now, of course, this doesn’t work for everyone. I knew a woman who was so sweet to me and my drivers and it was shocking to see her interaction with her caregivers. She really hated having someone in her space, but sadly, she needed it. The best thing you can do in this situation is try to find the best fit for them. Maybe the first or second caregiver won’t be the right person for them, but the third might be just what they needed. Quite frankly, so long as your parent is physically and emotionally able to get out and be social, you should encourage it. I have noticed that my senior friends who had activities to look forward to were in much better emotional and physical health than those who only went out for medical visits. Social activity combats loneliness, which has been linked to mental and health problems. Even if they have physical or cognitive limitations, finding ways to maintain their social activities is important to their overall well-being. You may need to enlist a companion or caregiver to participate in an activity with them, but whenever possible, they should stay active. I had a client with dementia who went to the gym multiple times per week because he truly enjoyed it. I also knew of a woman with dementia who played mah jong with a group of friends every week, with the help of her caregiver. We even took a woman in a wheelchair to the beach a few times a week to ride along the bike path. Find ways to make participation enjoyable, even if it isn’t the same as it was in the past.